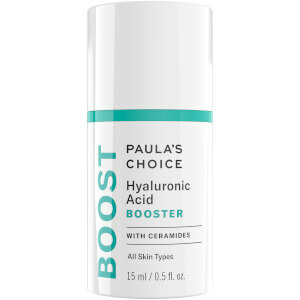 Formulated specifically for dry to extremely dry skin types, the Skin Recovery Softening Cream Cleanser from Paula's Choice effortlessly removes the build-up of excess oil, impurities and make-up to reveal a refreshed, clear complexion. Gentle enough for use on eczema, rosacea and sensitive skin, the hydrating cleanser is infused with soothing chamomile and antioxidant soybean oil to protect the skin's outer layer, effectively reducing redness and irritation. Experience calm, comfortable and supple skin with replenished moisture. E.N. Rinse well. Repeat or use with a clean wash cloth to remove heavy make-up. Aqua, Hydrogenated Polydecene (emollient thickener), Disodium Cocoamphodiacetate (mild cleansing agent), Glycine Soja (Soybean) Oil (antioxidant plant oil/emollient), C12-15 Alkyl Benzoate (emollient), Polysorbate-80 (emulsifier), Cocamidopropyl Betaine (mild cleansing agent), Chamomilla Recutita (Matricaria) Flower Extract (soothing agent), Oat Beta-Glucan (soothing agent), Paraffinum Liquidum (Mineral Oil, emollient), PEG-7 Glyceryl Cocoate (surfactant/emulsifier), Butylene Glycol (slip agent), Disodium EDTA (chelating agent), Laureth-4 (emulsifier), Acrylates/C10-30 Alkyl Acrylates Copolymer (stabilizer), Sodium Hydroxide (pH adjuster), Hexylene Glycol (preservative), Caprylyl Glycol (preservative), Chlorphenesin (preservative), Ethylhexylglycerin (preservative), Phenoxyethanol (preservative).